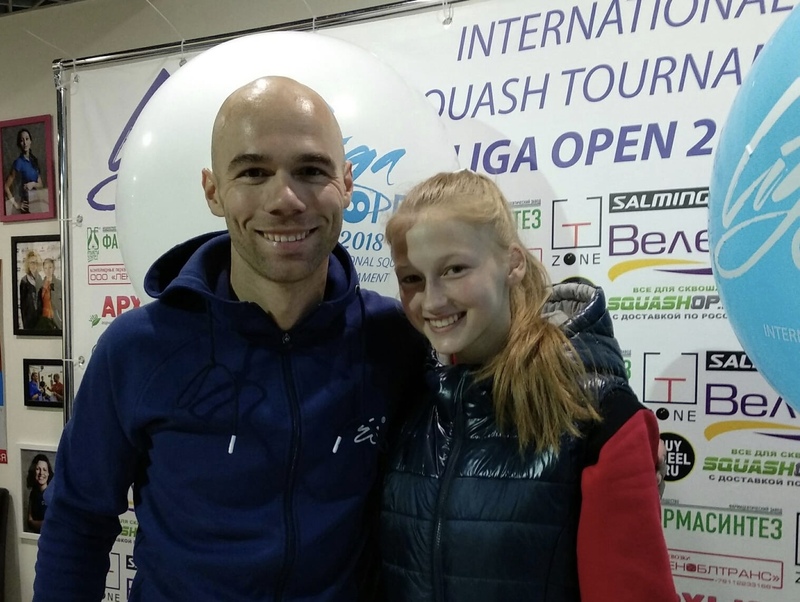 The fourth edition of the Squash Open (PSA Closed Satellite) took place at the LIGA Squash Centre in St Petersburg, ably hosted by Denis Rudakov and his team. In the match of the tournament, Piedro Schweertman squeezed through a fast-paced semi-final against Daniel Poleshchuk (11-7, 9-11, 9-11, 11-9, 12-10), then saw off his fellow Dutchman Rene Mijs (11-6, 5-11, 11-5, 11-9) to take the trophy. This was perhaps the final with the sharpest haircuts in PSA history. In the women’s event, the Nizhny Novgorod juniors Alesya Aleshina (aged 15) and Varvara Esina (aged 14) dispatched their more experienced opponents in the draw, with Alesya taking the final 11-7, 11-5, 11-5. In a high quality Masters 40+ final, David Sly (Canada) overcame Dovi Haruzi (Israel) 11-9, 7-11, 5-11, 11-6, 11-9, with some tight calls at crucial points at the end of the match, and some “lively discussion” with the referee. The tournament also included a number of other categories for amateur players and beginners. Ayuna Khantaeva commented: “This was my first experience as a PSA tournament promoter, and I’m happy that I was able to handle all the difficulties regarding the organisation of this event. For those who had not been to LIGA or the tournament before, the pre-tournament marketing certainly caught the eye. Piedro, you joined the tour in 2004, and reached your highest ranking of 63 in 2015 – surely you have retired just when you were coming into form? Yes, I joined PSA in 2004 but was only able to play a few tournaments outside of Europe. It was hard financially to travel any further as I was combining it with my studies and I bought a house. When all those things were settled I thought why not give it a go and with the help of sponsors I managed to make a successful comeback. When I stopped my best ranking was around 85, and when I came back my highest was 63. Now that I retired a year ago, I’m enjoying squash maybe even more. The combination of playing leagues and coaching is really fun. I still love to train and push myself so the leagues are perfect for that. Over the years you have been a regular supporter of PSA tournaments in countries like Russia, Ukraine and Belarus, where winter temperatures can fall below -20C… Is this why they call you the “Iceman”? Yes, I love to go to these countries. The people always take care of you really well and appreciate your effort of coming. Most things you read about those countries are negative. And to look back at all the tournaments I played they were all positive. I didn’t experience any negative things here. I actually don’t like the cold that much, but because I don’t have that much emotions on court some people started calling me the Iceman. Pretty funny because I think off court I’m the complete opposite! You just took part in the LIGA Squash Open – how was it for you? Looking back at it, it went pretty well – I won:) I was 3/4 seed but managed to take out the number 1 seed in a very good battle which could’ve gone either way. In the final I beat a good Dutch friend of mine. It doesn’t happen that often that you play a fellow countryman in an international tournament. What are your impressions of the way the sport is developing in these countries? What advice would you give to the organisers and players looking to raise the participation and standard of play in countries like these where squash is still in its infancy and relatively unknown? I think squash is really growing in the countries you named. Courts are being built instead of getting knocked down. If you look at certain countries in Europe, they are losing more courts than are being added. The best thing is that more people are starting to play squash and more international tournaments are being organised. If you have the numbers, talent will follow and with the guidance of good (international) coaches they will develop. England and France, for example, have been playing squash for a very long time. They always had good players and coaches which help the next generation to motivate themselves and improve. In these tournaments, and with the respective federations, there has been a big effort to increase the knowledge and application of the rules of squash among the squash community and volunteer referees – seminars, discussion groups where video clips are analysed, etc. Do you think things are on the right track? It’s a very good thing they are doing all these activities to learn. It doesn’t automatically follow that if you played PSA or at a high level you are a good ref, but I think it will help understand certain situations a bit better. And Piedro invites everyone to join him for the St Petersburg Squash Cup coming up at the PRO Sports Centre on November 23-25.